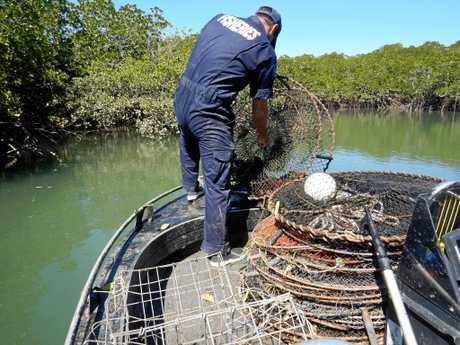 FISHERIES Queensland officers have snagged nearly 150 derelict and unmarked crab pots and dillies "ghost fishing" in Mackay's Net Free Zone during a four-day operation. Officers removed 147 pots from the zone between Victor Creek, Seaforth to St Helens, said Queensland Boating and Fisheries Patrol Field Officer Chayse Tilley. "The Seaforth area is a popular crabbing destination for locals and visitors hoping to catch a feed of crabs. There were 147 crab pots removed from the water and most were sunken and mud-filled after fishers failed to collect them after fishing," he said. "Some of the crabbing apparatus didn't have the owner's names on either the floats, tags or pots and these were seized as they didn't comply with Fisheries regulations. 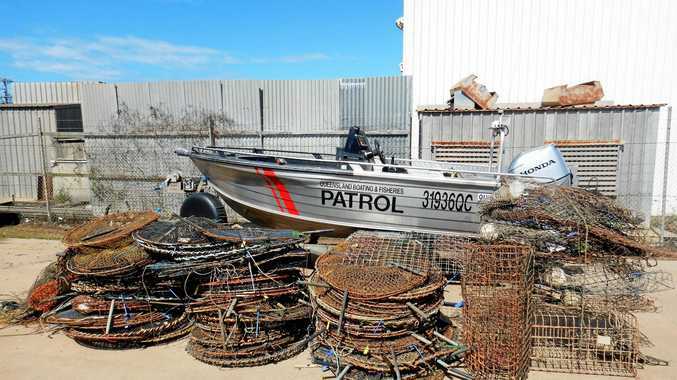 The high number of abandoned crab pots recovered by Queensland Boating and Fisheries Patrol shows that greater care needs to be taken by fishers setting crab pots to ensure pots which aren't being used to fish are removed from the water to avoid ghost fishing." Ghost fishing occurs when lost or abandoned fishing gear catches fish or other wildlife. 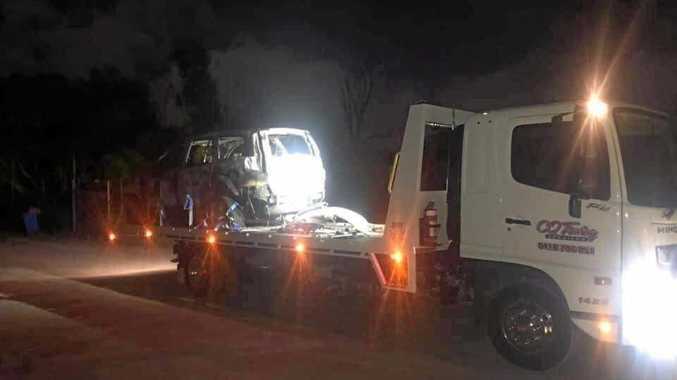 When asked if there was particular problem spots regarding lost or abandoned pots in the Mackay region, Mr Tilley pointed to the area targeted in the latest operation. "Crab fishing happens all over the Mackay region. The Queensland Boating and Fisheries Patrol operation focused on Seaforth to St Helens beach where there is a high volume of crabbing," he said. "Abandoned and lost crab pots are an issue across Queensland. "The large tidal range in the Mackay region could contribute to some inexperienced crabbers not allowing enough rope or adequate weight to their crab apparatus. "Large tides can wash crab pots out of a waterway or into mangroves." Queensland Boating and Fisheries Patrol regularly undertakes crab pot clean ups across the state, however. Mr Tilley described crabbing as one of the state's most popular forms of fishing and environmental impacts must be a consideration. He noted some pots can trap non-target marine animals, including turtles. "The proper use of fishing gear is ultimately the responsibility of fishers," Mr Tilley emphasised. Fisheries Queensland asks crabbers to ensure pots are properly weighted or correctly and lawfully tided off to allow for the large tidal movements of water. For details about fishing rules and regulations visit fisheries.qld.gov.au online, or call 13 25 23. Anyone who spots suspected unmarked, lost or abandoned crabbing apparatus, should record an accurate location (GPS coordinates) of the apparatus and report it to the closest QBFP office. A range of legal requirements apply to crab fishing in Queensland including restrictions on fishing gear and size and possession limits. In tidal waters, no more than four crab pots or dillies, or a combination of both, may be used per person at any time. Crab pots and dillies must be marked by an identifying tag showing the owner's name and address. All crab apparatus, if not secured to a fixed object, must have a surface float attached. Surface floats should be a light colour and robust, such as solid polystyrene, and measure 15 cm in all dimensions. If using a float, it must also have the owner's name on it. Crabbers should ensure their pots have enough rope attached to the float so they are not lost in strong tidal currents. Fishers must ensure crab pots are set in a sufficient depth of water at all stages of the tide so that marine animals are not exposed to the sun and unwanted crabs can be released alive. Fisheries officers are able to issue infringement notices for general littering which occurs in marine parks. Under Fisheries regulations, a Fisheries Infringement Notice can be issued for failing to mark crabbing apparatus in the prescribed way or failing to use the prescribed size or type of float. It is an offence to interfere with fishing gear you didn't set including crab pots. Queensland Boating and Fisheries Patrol works to clean up non-compliant crabbing apparatus, in conjunction with marine conservation groups where possible, and continues to educate the community about correct fishing practices which protect the marine environment. If anyone suspects illegal fishing activity, they should report it to the Fishwatch hotline on 1800 017 116 so that it can be investigated.